Containment Protocols: RPC-635 is currently not fully contained, however approximately twenty-six copies of RPC-635 are contained by Authority personnel. All copies of RPC-635 are to be kept in a warehouse in Site-002, and are not to be accessed by any personnel below Level 2 clearance. 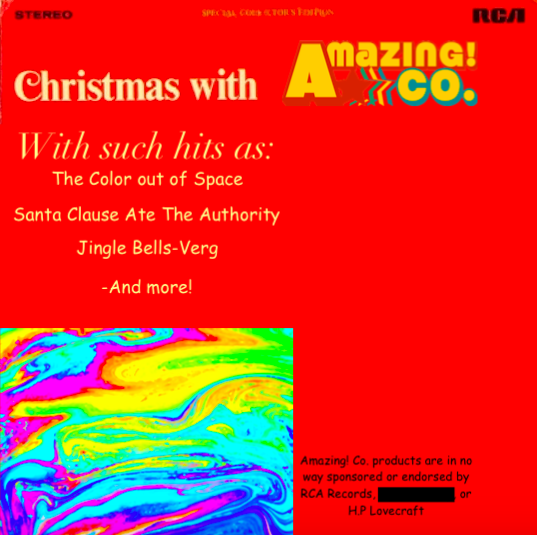 Description: RPC-635 is an anomalous record set titled "Christmas With Amazing! Co." Currently, all instances of RPC-635 have yet to be discovered. On the exterior, RPC-635 appears to be a normal box of non-anomalous 12-inch LP vinyl records, dating to approximately 1960. However, the cover art of all RPC-635 instances bares the Amazing! Co. logo, and has a list of songs which do not exist. If a sapient entity is to listen to RPC-635, numerous anomalies may occur, each coinciding with a different song. If one is to listen to the song titled "The Color out of Space," for instance, the listener's vision will become a swirling mass of colors. There are a total of six songs in the album, each with varying degrees of lethality. It has been hypothesized that, if the album were to be played at a party, all attending members that hear RPC-635 in full will be either mortally wounded, or instantly terminated by the anomalies contained within the record. Of the existing six records, three are deemed too lethal for research purposes. A total of three songs have been deemed safe for human listening by Authority personnel, and have been converted to mp3 format for research purposes. While these songs have been deemed safe, it cannot be understated that they still hold anomalous effects. Listening is restricted to testing only, and not recreational use. Extreme caution is advised when testing. Disclaimer: Contrary to popular belief, RPC-635 was not "the original Christmas album", nor was it created by non-anomalous means. This is a misinformation campaign spread by Amazing! Co. in order to resist containment by the Authority. This is in no way factual, and any recovered albums with the Amazing! Co. logo are to be documented as RPC-635 instances and reported immediately. Any personnel found to have not reported them are to be screened thoroughly for memetic influence by RPC-635, or any related misinformation campaigns created by Amazing! Co. Copies of RPC-635 have been observed only during what would be considered the holiday season, and mainly in countries that celebrate Christmas, and/or other western-oriented winter celebrations. The songs change language depending on the main language of the country they are found in, and no record stores have recollection of ever buying the albums, only selling them. Customers who buy RPC-635 say that they feel an urge to do so, only by the strange names on the cover of the album. This has been confirmed not to be anomalous, just a strange coincidence.